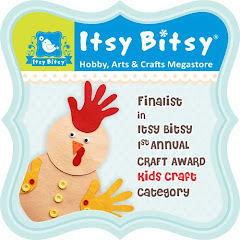 Confessions of a Craftoholic !! 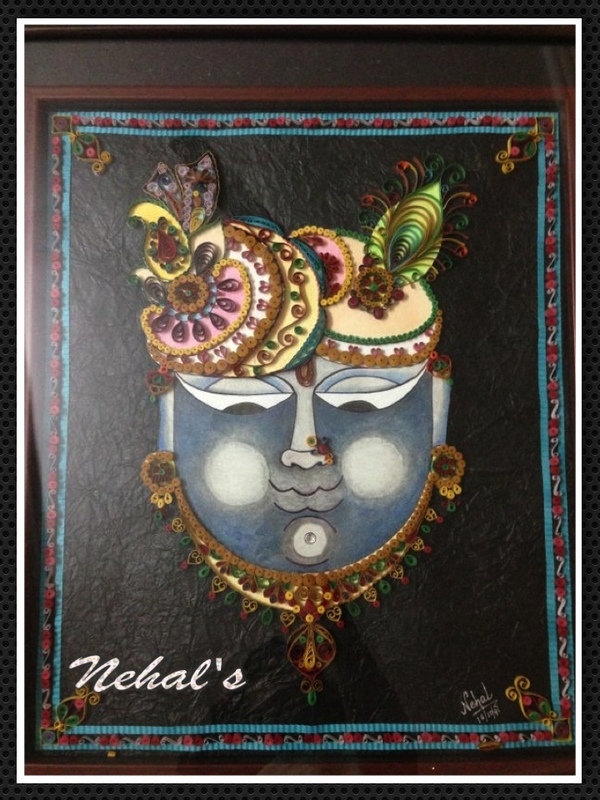 After an awfully long vacation, here I am back to my world of blogging.. I would totally blame my laziness for staying away so long and hope that I would put my creative cells yo use henceforth.. So what's the bang all about?? 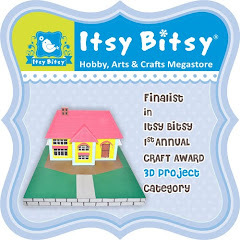 Stay tuned for some awesome candies and competition coming your way!! 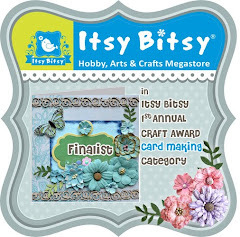 Its been a busy busy month for me and I have just not put my creative cells to work much.But I can never miss out on the ITSY BITSY contest which is quite close to my heart. Now without wasting much of time let me show you what I created. 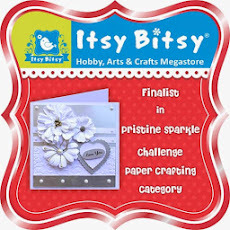 The glitter element I have used here is the entire Glitter paper from ItsyBitsy. 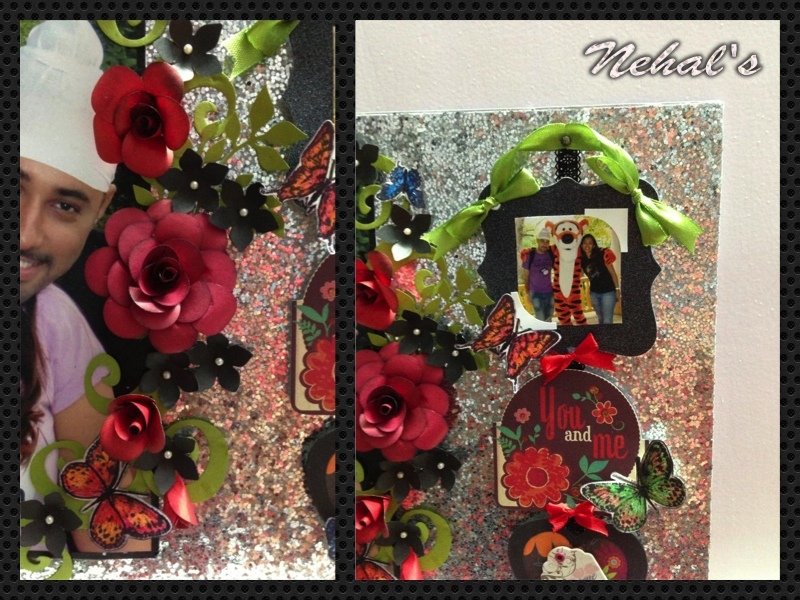 The side hanging frame with our pic is on a Black glitter paper, again from Itsybitsy and not to forget the glitter on the sentiments, laast but not the least the pearls adorning the black flowers. 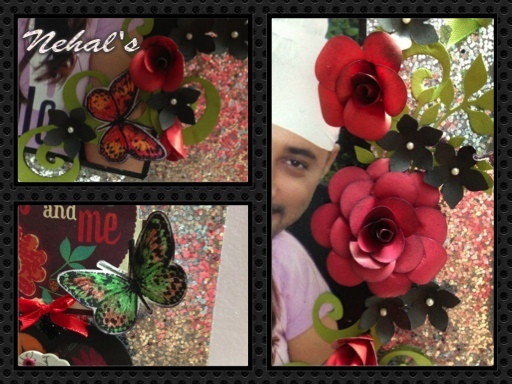 I take pride in informing that the butterflies are stamped and coloured with water- soluble, pencil colours and the roses are handmade using the balloon punch. 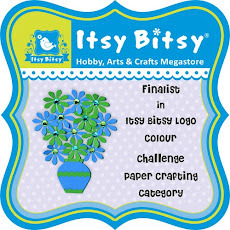 Itsy Bitsy " All that Glitters"
Craft your Passion "in the garden "
Creative inspirations "anything goes-option of ribbon "
Deep Ocean Challenge 'welcome summer"
Pin and tack "anything goes"
Huffff, finally managed to complete my entry for ItsyBitsy's Pristine Sparkle Challenge. It was quite a challenge. I have never really worked with only white before. I wasted the first 15 days in just planning on what to create but all in vain. Finally my saviour was a friends house warming party. This house warming gift box goodie bag is made using only White and silver, the sentiments are also stamped using silver.Ok enough of blabbering, let me give you a look of it !! 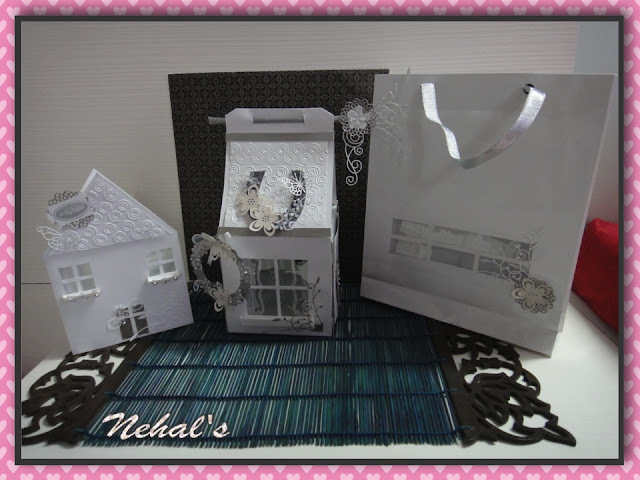 The goodies include a gift box in the shape of a house, a card to match with the box and has the same transparent cut windows, an envelope to match the card and lastly a bag with the same cut, transparent window. 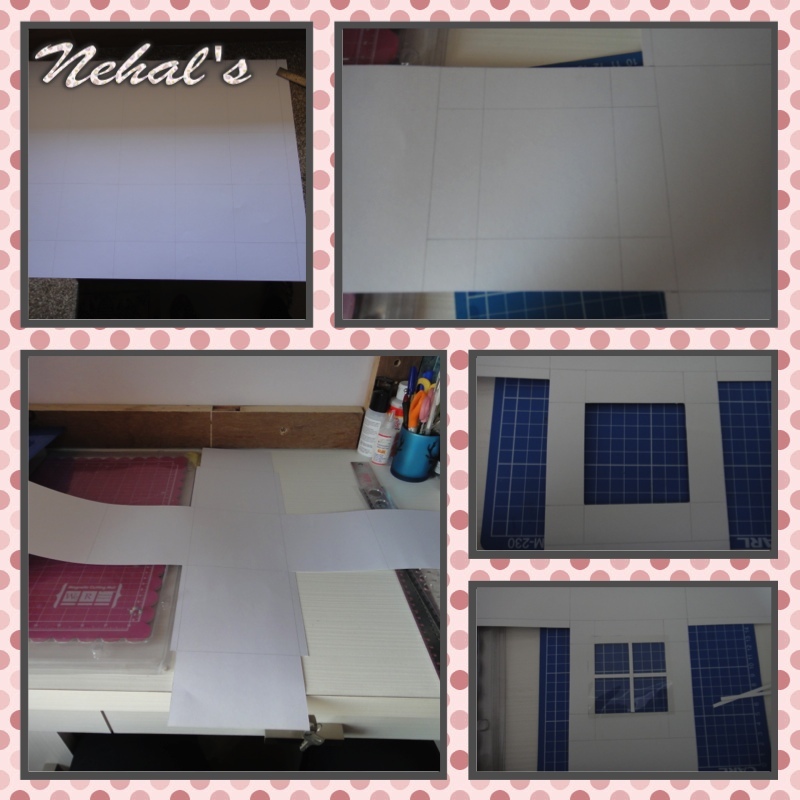 Making the box was quite a task for me as I am bad at making my own measurements. 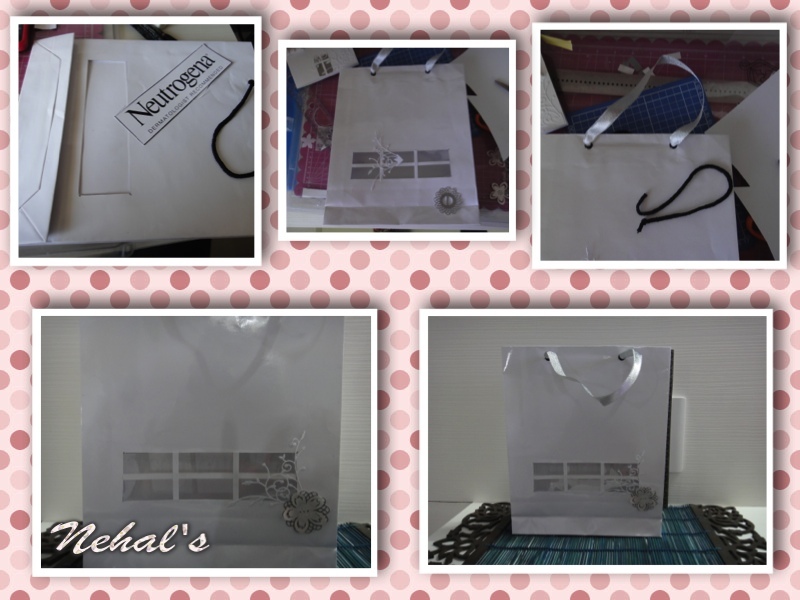 I have always made gift boxes with the help of ready measurements available on the net. 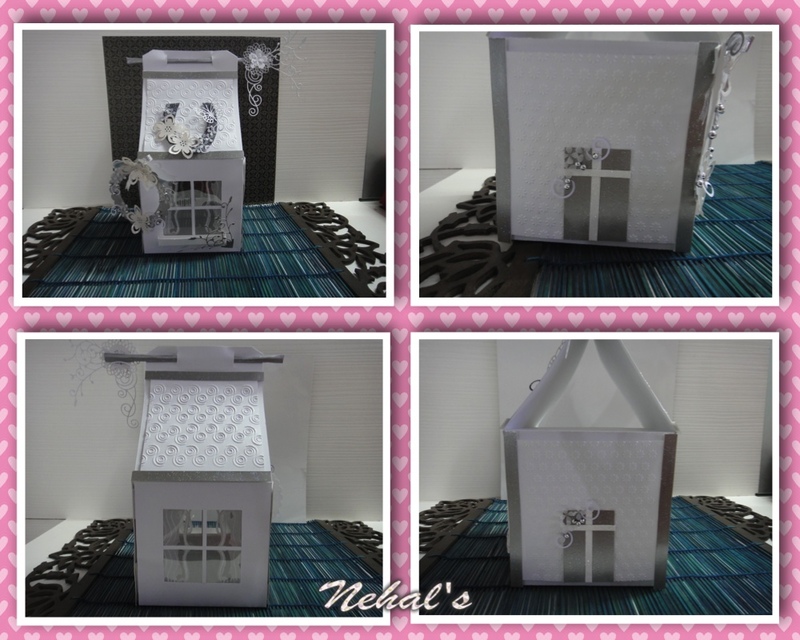 The gift box is 6"-6" and 9" in length. 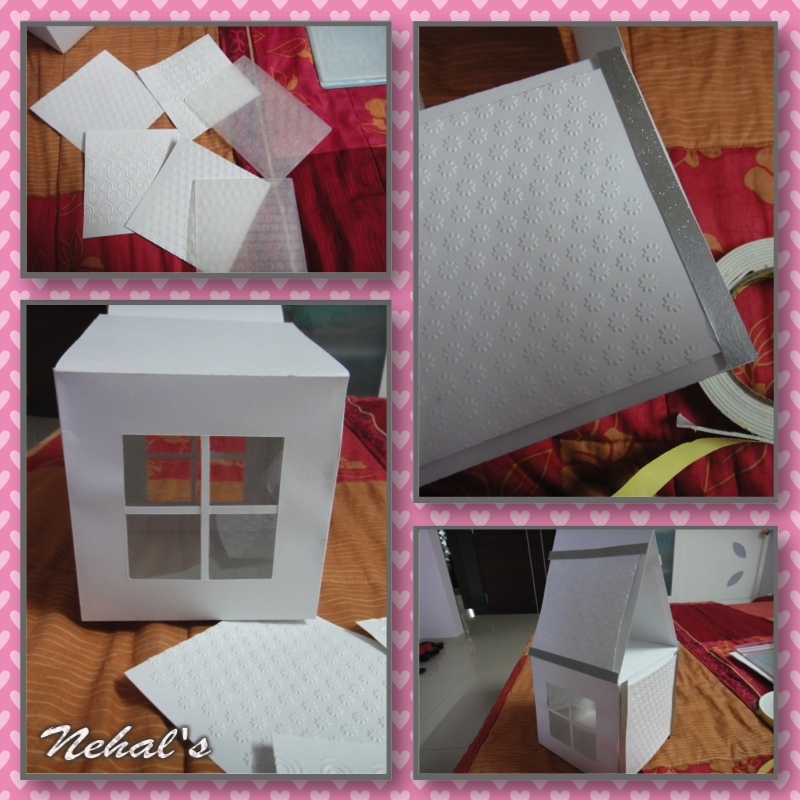 I have used the thick white ivory sheet for the box. I wanted to give it a glass window look so I have cut out the windows on both sides and used OHP sheets to give it the glass look. As plain white looks pretty dull and boring, I embossed few white sheets in 2 different designes. 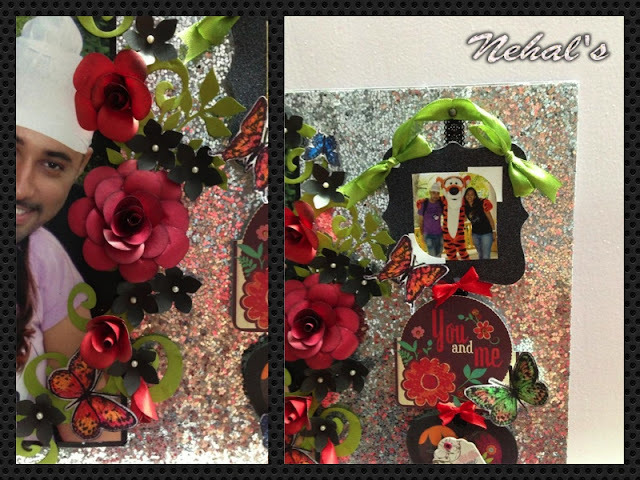 2 sides of the box has cut windows and the other 2 opposite sides have embossed sheets to give it a textured wall look. I have also used embossed paper sheets for the sloping roof. I have used two-way tape to stick the sheets to give it a raised look. As its for a housewarming occasion I wanted to add few elements for good luck.I have added a paper-wreath , a floral horse shoe made from silver foam sheet and a glitter cross on the doors of the house. 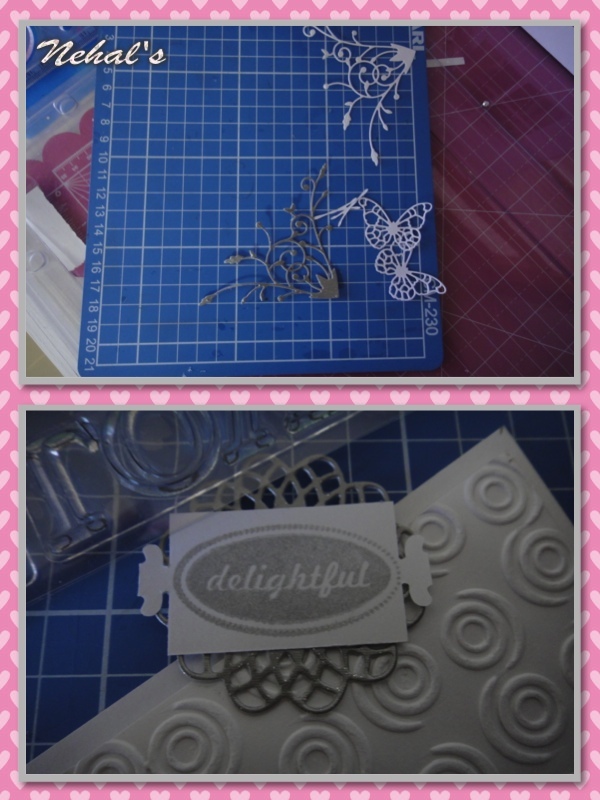 Few more embellishments using Memory-box dies. 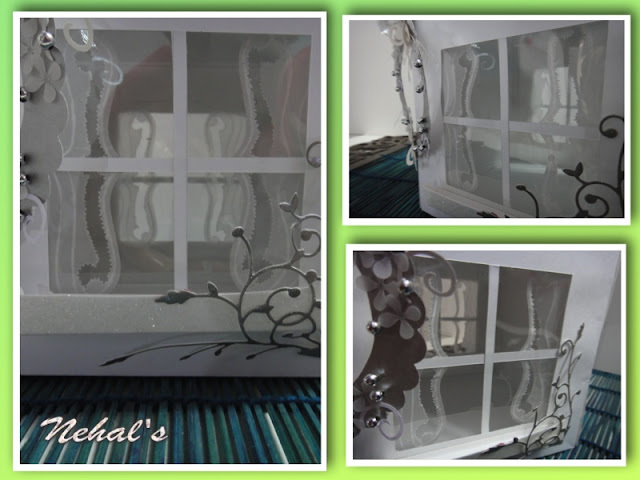 Few close-clicks of my window :) Dont forget to check out the pot tray below the windows. 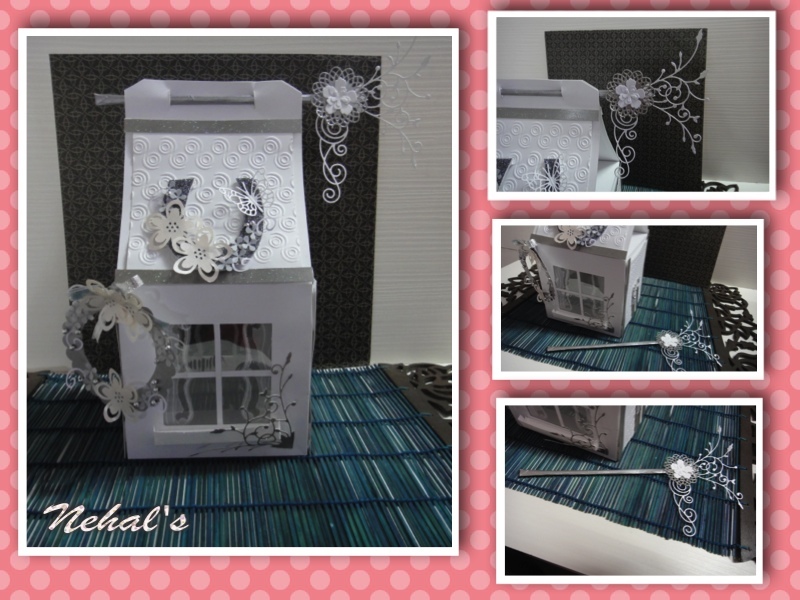 Idea from all the pretty houses in Switzerland with the flower-pot baskets below the windows!! 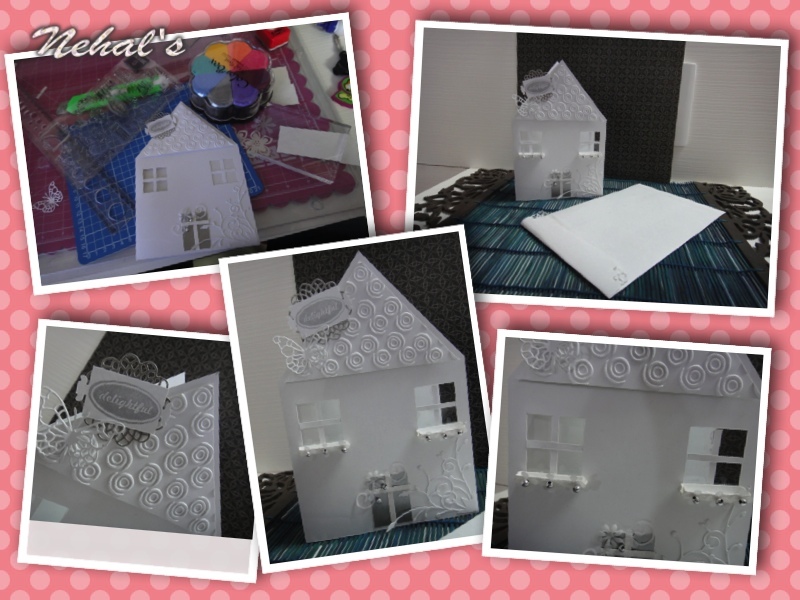 My house from all the four-sides!! 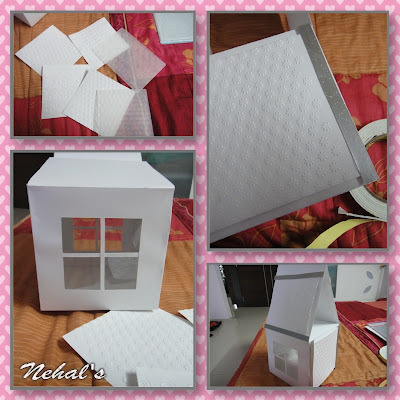 Time for something that I am really proud of myself (Donkey that I am , I cant stay away from praising myself).I wanted the box to be re-usable and so I wanted to avoid using glue to stick the sides after packing the gift and make it useless after using it once and for that I have flicked the idea from my mom's bun clip.She uses a bun stick which she slides and fixes her bun to keep it intact and the same idea I have used to hold the sides of the box to close it. Now comes the card, just like the box I have embossed the roof in the card too, the glass windows, cross on the door and the flower-pot trays below the windows and a matching envelope to go. 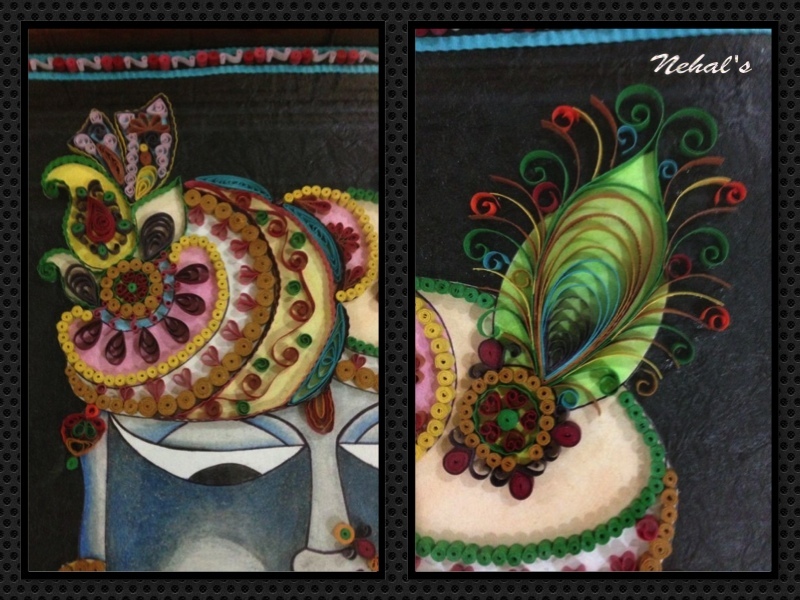 I dint not want to take pains of folding a bag myself so i used a cosmetic bag for the same and made a cut window to match the box and the card and embellished a corner with flourishes and flowers to match.This was the longest project and post till now :) Thanx for your patience. 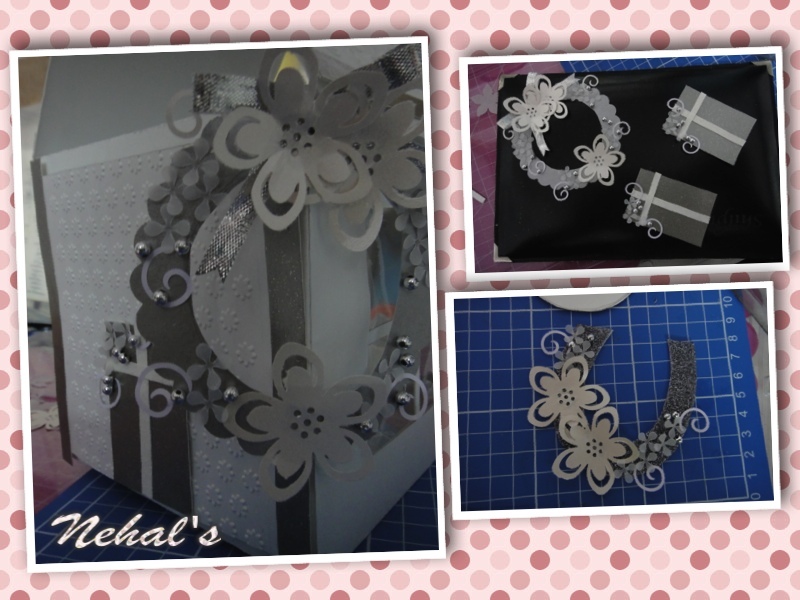 Fussy and Fancy challenge-Bling it on( silver pearls and glitter foam sheets and paper. 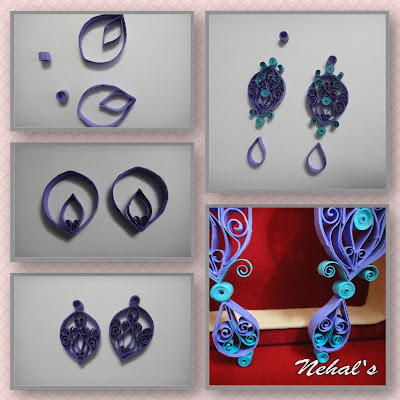 Started quilling jewellery recently and I must say its addictive. 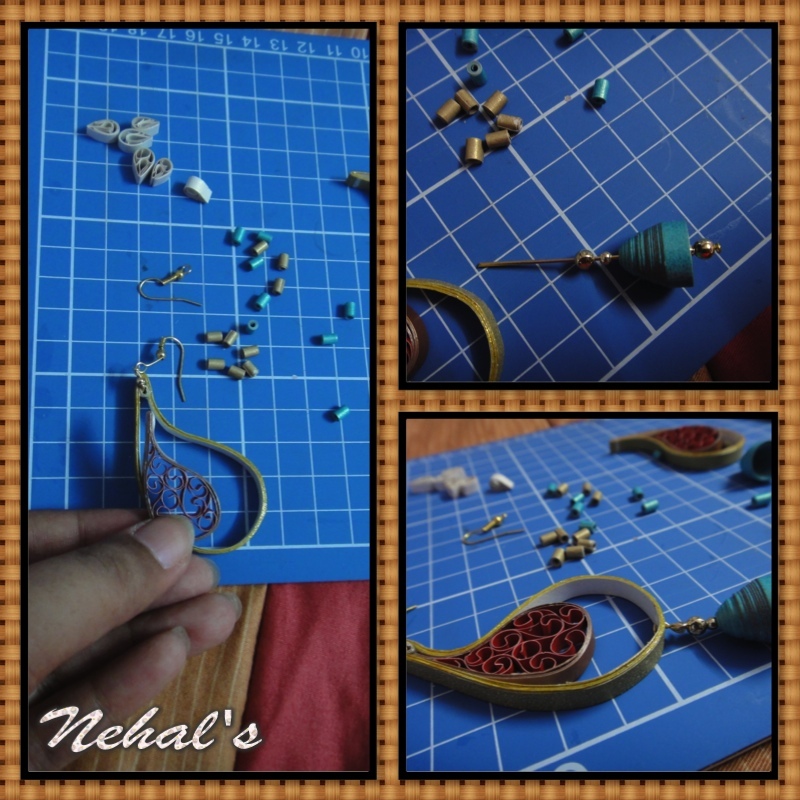 The above earrings are approximately 4.5"-3"and are made from strips cut from metallic papers. 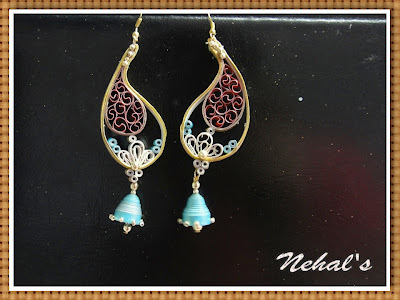 I like the glittery bling in earrings.Following are few steps showing how I created them. 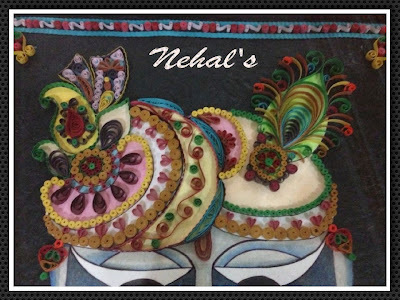 The Paisley shape gets bit tricky as I have not filled the whole thing, and to retain the shape once I got the desired shape I applied Modpodge over it and it did help. I experimented with beehive technique for the first time and it was fun. Finally came the part of fixing the hoop and the jumkhas, and i confess it took a lot of time for setting it right. Last but not the least i coated the whole thing with Modpodge. 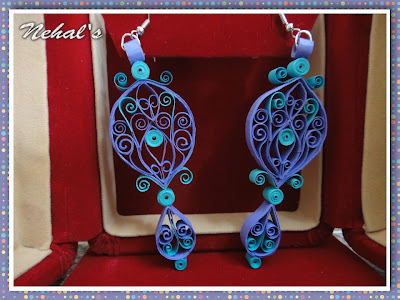 Here I am with my Quilled Earrings project for Adhiraa Creations, I have always experimented a lot with quilling but this is my first time playing with jewellery. I have hoarded those metal earring loops and a lot of designs since quite some time and I finally got some courage to put them to use for Use it Tuesday !! 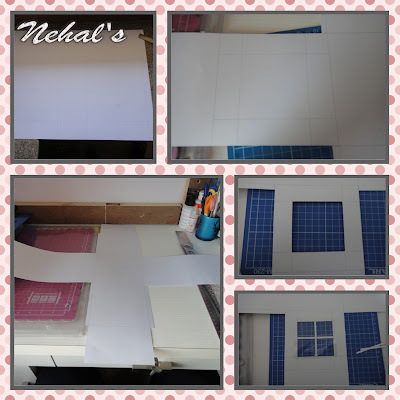 Here i have used purple and blue tinted papers to cut the strips. I was pleasantly surprised that it dint take more thn 4 purple and 2 blue strips per earring.The earrings are about 4.5"-2" in size. 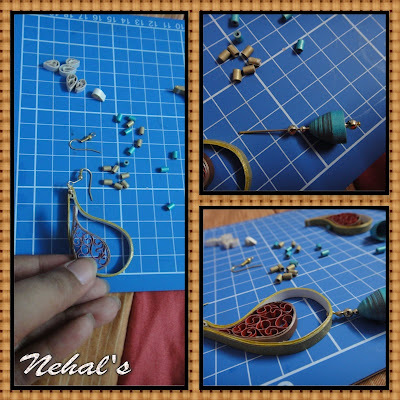 What I noticed is, initially the outer shape can be tricky to maintain, but once the filling is done it does retain the desired shape.I wanted to give it a traditional look, hence the spiral filigree!! 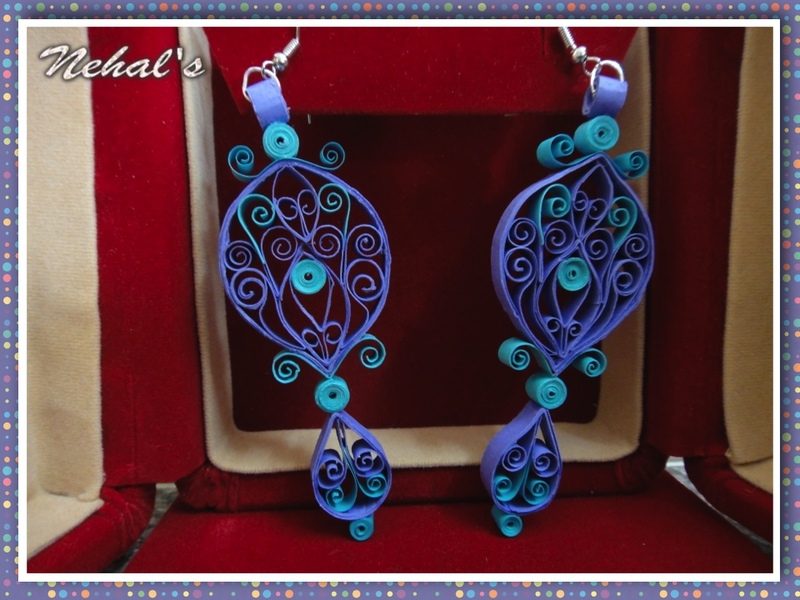 I want to thank Adiraa Creations for my attempt in Quilled jewellery !! 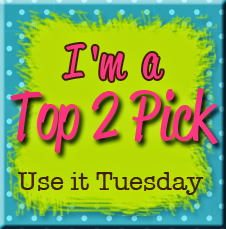 I am super excited today as i won my first candy today :) Never been so lucky, thanx to Colour Conceptions for the yummy candy !! 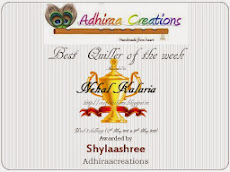 I am gonna showcase my entry for 2nd week at Adhiraacreations. 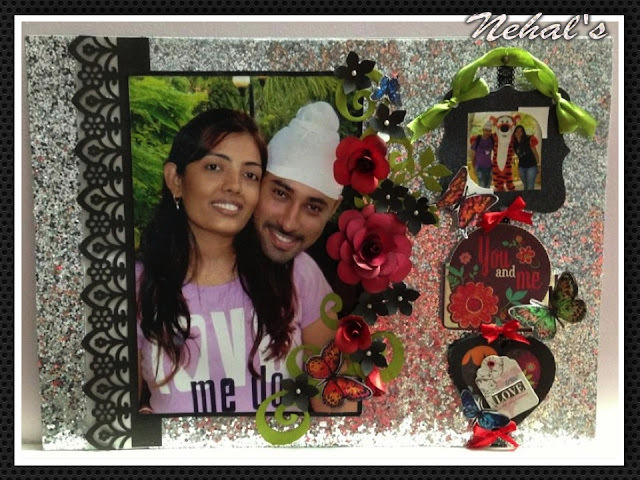 This is a Shreenathji frame I have made for my mom. 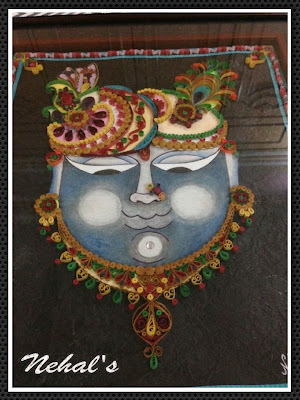 I sketched it myself and coloured it using dry crayons.The main technique I have used here is paper quilling as required by the contest. 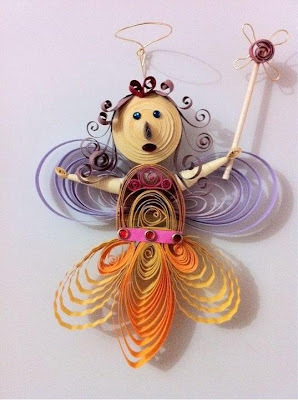 I prefer cutting quilling strips on my own from the tinted papers as it has more colour variations and they are thick and stiff to use, which helps in retaining the shapes. 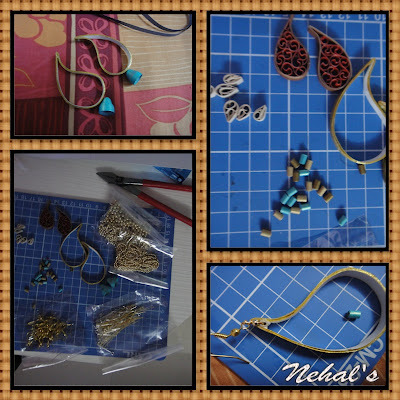 I tried using golden glitter paper for the jewellery but somehow it gave a gaudy look to the whole mate finish so replaced it with golden brown. 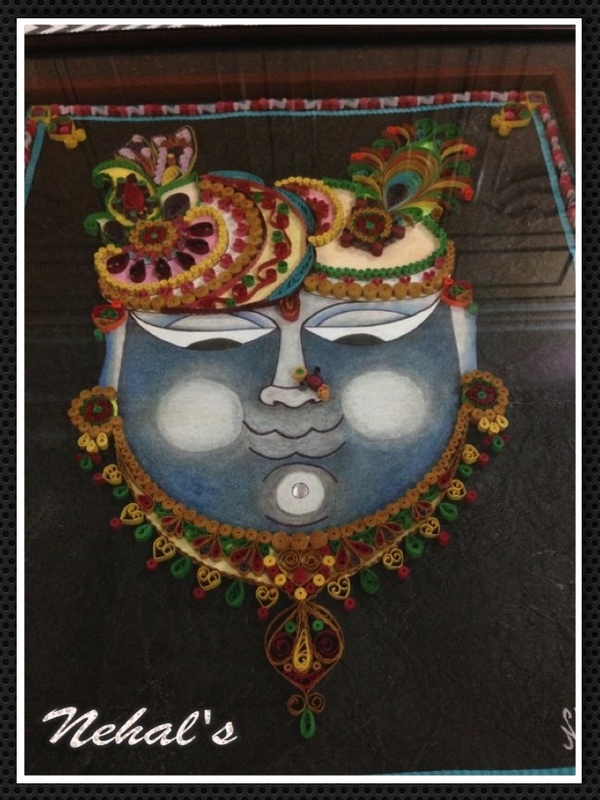 I have given quite a lot of detailing to the border as well as u can see in the picture. 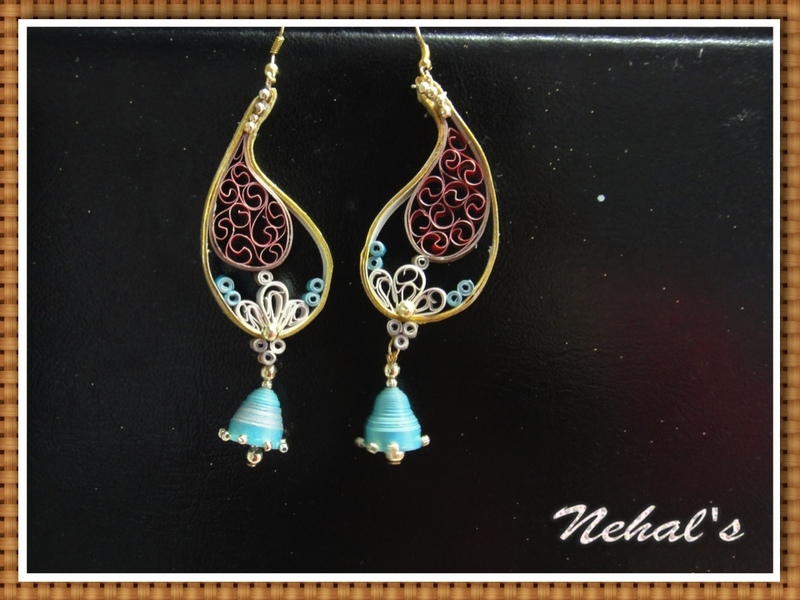 The jewellery has a very delicate and intricate design. The Saffan (head cover) of the portrait has paisley designs which gives it an Indian look. Few close ups. 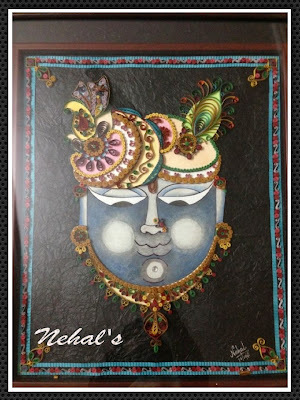 I really love making a peacock feather with paper quilling,,i have kept it a little simple here. 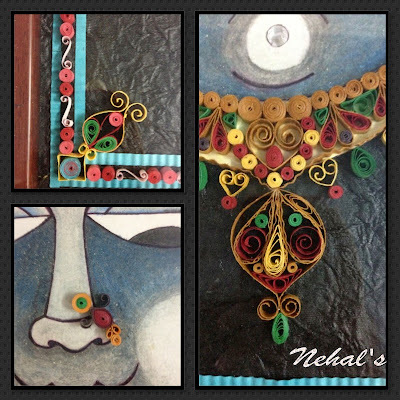 The close up of the necklace. Hope u all are enjoying the summer sun..its really hot and humid in my part of the world, but mangoes are sure fun. 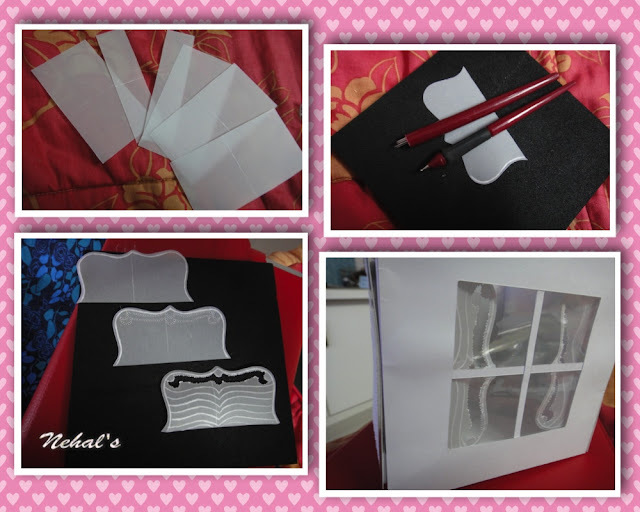 I prefer cutting paper stripes from the tinted papers, I like working with stiff paper as it retains the shape. This is a fridge magnet I have made using handcut paper stripes, for the wand I have used a tooth pick. A 3D Quilled Jewellery box! !